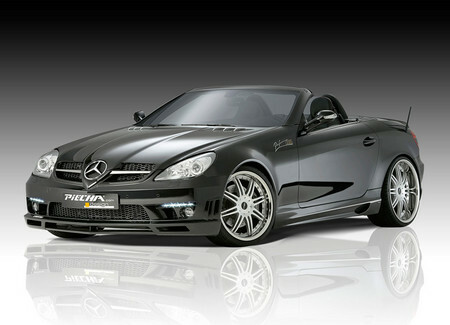 The current generation of Mercedes SLK is quite old now and it’s spending the very last years of its existence in the market. But it still looks very fresh and nice. That is enough reason for Piecha Design to release a new tuning program for it. The package consists of an aerodynamic kit, sport exhaust system, and new set of wheels. As for the bodykit, you get new front and rear aprons with spoiler and diffuser, plus side skirts, new grille inserts, boot lid wing and LED lights. You also get a glass wind deflector. As for the wheels, you get 8.5×19 with 225/35 ZR19 front and 9.5×20 with 265/25 ZR20 for rear. They also offer Piecha QUADRO exhaust systems for both four and six cylinder models.